Dominique Rodgers-Cromartie signed a one-year deal with Broncos late Wednesday night. Nobody knows the holes in DRC’s game better than Eagles observers, but many believed there would be some competition for the talented 26-year-old. It never developed, and DRC finds himself on a prove-it contract in Denver. 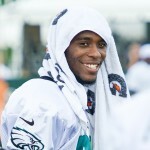 His signing solidifies the fact that the Eagles will go into 2013 with two new starting corners. They inked former Ram Bradley Fletcher to a two-year deal on the first day of free agency to compete for a job, but the all-important position remains paper thin at the moment. There is a host of pressing issues when it comes to the Eagles’ secondary, but you’ll have to excuse new defensive backs coach John Lovett if he doesn’t yet have all the answers. If nothing else, Eagles players have stayed on message over the past two seasons. They entered the 2011 campaign bullish about the assembled talent (along with just about everybody else). And, despite an 11-15 record since, some continue to tout the team’s potency. As the 3-7 Eagles get set to take on the 2-8 Panthers in a showdown of the two worst teams in the NFC, here is a “best-0f” compilation of quotes that prove confidence is not the issue on this club. There were signs of life for the first time in weeks. Marty Mornhinweg foreshadowed these developments earlier in the day. There is nothing brewing on the Dominique Rodgers-Cromartie contract front, and that is not expected to change any time soon. 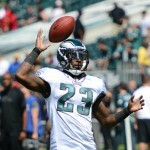 Nothing personal against the eccentric cornerback; the Eagles are not negotiating with any players at the moment, choosing instead to focus their energies on the season at hand. They have tried to stick to the policy of no in-season contract negotiations for the past few years. The Eagles have some serious decisions to make when it comes to the corner position. Dominique Rodgers-Cromartie and Asante Samuel are cut from the same cloth in a lot of ways. Both Florida boys. Both cornerbacks, obviously. Both funny, eccentric. Both playmakers. In another set of circumstances, it would be no surprise if the two ended up being good friends. But the situation last year had the two prideful vets pitted against one another to a degree.